Submitted by Taps Coogan on the 23rd of March 2018 to The Sounding Line. The US is moving to impose roughly $60 billion of tariffs on 1,300 categories of Chinese imports. China is threatening to reciprocate with $3 billion of tariffs on 150 US exports to China. With headlines flooded with warnings of a looming trade war, let’s take at look at the trade relations between the US and China. In 2016, the most recent date for which complete data is available, the US exported goods worth $115.6 billion to China. For those wondering what the US actually exports to China, the following interactive chart breaks down those exports to China by type. You can click on each box for more detail. The largest categories of US exports to China are electronics and machines (integrated circuits, broadcasting equipment, computers, valves, pumps etc…), agricultural products (soybeans, sorghum, etc…), and cars and car parts. In addition to these categories, a large portion of the US exports to China represent food, medicines, and raw materials such as: wood, scrap paper, and scrap iron. In return, China exported $462 billion worth of goods to the US. The largest categories of Chinese exports are electronics and machines (integrated circuits, broadcasting equipment, computers, etc…), miscellaneous goods (furniture, lights, seats, etc…), clothing, and pretty much any product you can find for sale in a ‘big box’ store in the US. The vast majority of Chinese exports to the US are finished manufactured goods. The graphic below details only $386 billion of the $462 billion of Chinese exports to the US, so about $80 billion of exports remain unspecified. The short math of a trade war between the US and China is straightforward. The US can impose many times more tariffs on Chinese products than China can impose on the US due to the large trade imbalance. Furthermore, exports to China simply aren’t as important to the US economy as exports to the US are for China. If China truly wishes to avoid a trade war, the best course of action would be to reduce their barriers to US imports. 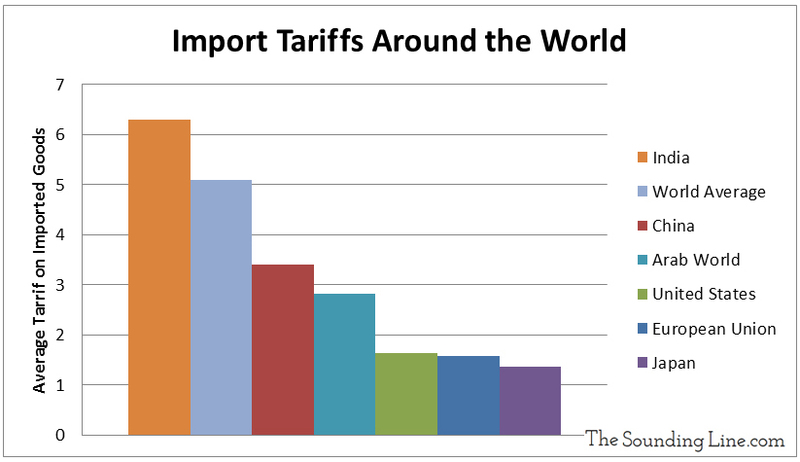 As the following chart shows, average Chinese tariffs are twice as high as US tariffs. Since China’s tariffs were already double the US, and the world average is triple the US, isn’t it a bit disingenuous for anyone to claim the US is “starting” a trade war? The solution to this is to shine a bright light on EVERYONE’S tariff practices, and the third graph in this article, short as it is on details, is as close as I’ve seen to the truth in any article since Trump’s steel and aluminum tariffs were announced. The numbers show that the US depends more on China than China depends on the US. We get real things from China and they get worthless $$. Our economy is supported by China not theirs by us. Their business is about business. Our business has been threatening war for the past 70 years. USD is the world reserve currency and far from worthless on international markets. China has a lot of USD to pay for imports plus a big surplus on balance of trade. Surplus that can be loaned back to the US plus interest and buy oil. So for all those Chinese TV’s, PC’s and goods that American’s buy, they borrow their own money back and pay for the privilege.